Father Swift was ordained to the priesthood for the Diocese of Oklahoma City - Tulsa on Sept. 23, 1944 at Our Lady's Cathedral in Oklahoma City. From 1950 till 1952 he was a chaplain in the U.S. Army. He served as an associate pastor at Christ the King (Tulsa), and as pastor of St. Joseph (Bristow), St. John the Baptist (Edmond), Sacred Heart (Muskogee), St. Pius X (Tulsa), St. Michael (Henryetta), and as the chaplain of St. John Hospital in Tulsa. After his "official retirement" in 1988 he served as senior priest at St. Mary's in Tulsa until Jan. 1, 2013. He then moved to Franciscan Villa in Broken Arrow, where he served as chaplain until his death. In addition to these pastoral assignments, Father Swift served on various diocesan boards and committees. He was known for his priestly zeal, his various hobbies and his love and enjoyment of life! He was preceded in death by: his parents; and his brothers, F.W. and Thomas Swift. He is survived by: his sister, Sister Mary Grace Swift, O.S.U. of Maple Mound, KY; and his nieces and nephews. 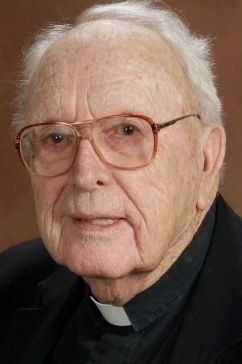 Father Swift requested that any memorial gifts be made to: the Priest Retirement Fund - of the Diocese of Tulsa, P.O Box 690240, Tulsa, OK 74169. Viewing will be from 12:00 (noon) to 5:00 p.m. on Tuesday, Dec. 9, 2014 at Fitzgerald Ivy Chapel. Vigil Service will be at 7:00 p.m. on Tuesday, and the Funeral Mass on Wednesday at 11:00 a.m., both at Holy Family Cathedral in Tulsa, OK with Interment will follow at Memorial Park Cemetery in Bartlesville, OK. Fitzgerald Ivy Chapel, 918-585-1151.